1. The main frame adopts 380 volts three-phase AC power supply with the control circuit input voltage of ~ 220V. The safe use of electricity shall be paid attention and the operation and maintenance of the machine shall not be carried out by non-professionals. The anti-phase of power supply shall not occur in the wiring. Otherwise, the machine cannot normally operate. 2. During startup and shutdown of the machine, the working table may move up and down, front and back and left and right or by deflection. In order to ensure safety of personnel and equipment, the machine shall be more than 30 cm from other objects or wall in the installation. The head shall not extend below the working table when the machine operates. 3. When the machine is installed, the packaging-transport board on the bottom shall be removed and the base shall be leveled. . To facilitate the move, the machine is equipped with four wheels on the base plate. In the normal use of the machine, the vibrations may be large if only four wheels touch the ground. So the four anchor bolts on the base plate can be screwed up and arrive on the hard iron plate; or the whole base is placed on the square bar wood. In short, no matter any method used, it is proper as long as the machine chassis is placed stably. 4. The working table shall keep clean and tidy, and hard objects or debris shall not be piled up on the working table to prevent working table bumping. 5. The venturi shall be tightened for plastic air pipe to prevent the pipe off. 1. Installation requirements: remove wood boards of packaging-transport box, screw four anchor bolts into the screw holes of machine base from top to bottom, adjust the height of base plate and make leveling. 2. Startup preparation: Plug properly in the power socket, close the three-phase knife switch in the control box on the base and then turn the “Power” switch on the control to "ON" so that the machine and control system are on standby. 3. Selection of tilt direction of working table: If the left tilt is selected, first turn the “Table Tilt” switch to the “Bottom Left” and first panel on the "tilt table" switch on the operation panel to "left" position, and move the cone below the platform to the right. If the right tilt is selected, first turn the “Table Tilt" switch on the operation panel to the “Bottom Right”, and move the cone below the platform to the left. 4. Hinge unfolding and erection: the left and right of operation panel are respectively equipped one hinge switch. When the table tilts to the left, the operating "Left Hinge" can not be unfolded to prevent the paper from falling, but the "Right Hinge" can be unfolded to facilitate trimming of big paper. When the table tilts to the right, the operating “Right Hinge” cannot unfold to prevent the paper from falling, but the “Left Hinge” can be unfolded to facilitate trimming of big paper. When the paper is longer than 905mm, the side paperboard shall always be open. 5. Stacking of paper: To improve the paper trimming speed, the papers to be trimmed shall be stacked neatly. In case of paper adhesion, the manual intervention and treatment shall be given. If the paper pile cannot be trimmed neatly for a long time, local papers can be drawn out to stack on the top. 6. Height and inclination adjustment of working table: the table height can be adjusted through the adjustment on four bolts below the working table and knurled nut below left and right steel wire rope, and the table inclination can be adjusted through the adjustment on the height of the nut below the cone. 7. Paper trimming: open the "Air Pump" switch and press on the foot switch so that the table drops and the vibration motor begins to operate. Vibration force can be adjusted by the "Vibration Frequency" knob. When the trimming is complete, once again press on the foot switch to make the table rise so that the air cushion makes easy moving of paper. 8. Paper pickup: when the air pump is in working condition, the paper moving is easy. 9. Switch off power switch: after the end of paper trimming, close the air pump switch and power switch on the panel and erect the hinge, switch off the main power switch in the control box and remove the power socket. 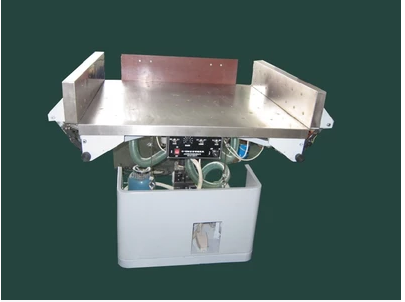 The machine adopts the microcomputer control system with strong anti-interference ability, and is also equipped with a vibrating motor frequency conversion system. To facilitate professional customer maintenance, the wiring diagram is provided for this machine. The lift spindle shall be regularly lubricated by grease, with grease hole on the spindle housing. Through the grease hole, the hand oiling and injection oiling by grease gun can be carried out. The gas circuit system on the bottom of machine panel shall be regularly checked to observe whether there is falling and loosening on the air tube interface. For the hinges on both sides, the fixing of two small hinge motors and corresponding limit switches shall be regularly checked. In case of displacement, the adjustment shall be timely made. Otherwise small motors will be burned. Check method: when the hinge is put levelly, the limit switch shall arrive at the circular cam. If not arriving, the small motor continues operating, which will be burned in case of long time. On the contrary, if the hinge forms 90-degree angle and hinge connecting rod is also tightened without the limit switch arriving at the corresponding circular cam, the motor will be burned in case of idling for a long time. Routine maintenance shall also be given to the up and down rotation of the spindle. It is again paid stress that there must be nothing below on the side of inclination. Some clients place at random the distribution cabinet below, so that the working table will touch the distribution cabinet once it operates, which is very improper. The limit switch of lift spindle shall also be checked regularly. There are four switches on the lift spindle, in which the top one is the lowering limit switch. The bottom one is the rising limit switch, the second highest one is the lowering safety switch which can play the role of lowering limit when the lowering limit switch fails. Similarly, the second lowest one is the rising safety switch which can play role of limiting in case that the rising limit switch fails. Keywords of operation panel: table tilt, bottom left, bottom right, left hinge, right hinge, unfolding, closing, power supply, air pump and vibration frequency. Identification keywords of instruction manual: limit switch, hinge limit switch, circular cam, small motor, stop block, rising limit switch, lowering limit switch, rising safety switch, lowering safety switch, vibration motor, lubrication hole (oil hole) and air eye.